I've taken a few days to recover from the weekend trip and am ready for my recap! I shopped so much, I don't even remember what I bought. Shopping was not at all what we expected. Some things were great and some not so great. Maybe I'm spoiled by the fantastic shops in St Louis, but I really didn't care for most of the vintage shops in Springfield. Average looking dresses were priced way too high in my opinion and I noted a few things that made my not make a purchase on principal alone (matching dress and jacket sold separately- I hate that!) So, this time I found that the grass is greener on my side of the fence! Heartland Antique Mall- We stopped here (in Lebanon) on the way to Springfield and it was pretty good. We hit the colorful glove jackpot and I found my adorable yellow train case, which was in great shape. 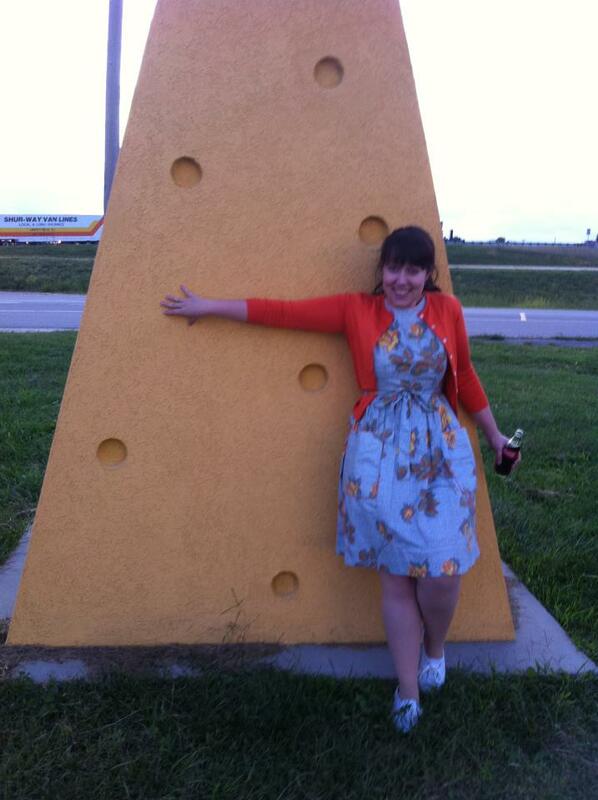 The antique mall is attached to a cheese outlet. Cheese and antiques- it doesn't get much better! The Cave Restaurant-The Cave Restaurant was a neat place. In the 1920's it was a dance hall/speakeasy. The only entrance was this slightly ominous staircase. Now, it's a restaurant full of odd taxidermy animals and live fish. We had BBQ, calimari and fried pickle spears. Yummy! Bryan battled this rouge turkey who was trying to attack his girl! The Urban Flea Market-Our first stop on Saturday morning. Very big, nice people, very cool place. We found a fantastic booth loaded with cheap, gorgeous vintage clothes and I scored this purple skirt, purple and pink "Good N Plenty" dress (as Pj calls it), a Victorian skirt and shawl, a sheer black 50's dress with lovely rhinestones, a vintage knit top and modern wedges. It was so great, I had to make a second trip in Sunday morning before we left town. STD Flea Market- By the name alone, we had to stop here. It is what you think- kind of grimy, lots of random stuff but wow, once again, we hit great vintage at great prices. I believe the booth was "The Cat's Meow" and it was over flowing with gorgeous vintage. We found SO many beautiful dresses for under $20 but sadly, most of them were too small for us. I did find this fantastic 40's dress with original belt and rhinestone buttons which I totally adore! the boys at STD Central! Relics Antique Mall-Relics is the biggest antique mall in the state. Amanda and I managed to find what seemed like the ONLY bakelite in the entire city of Springfield and we left home with all but two or three pieces. I also found a really unique dress pattern and gorgeous black 40's purse. Why, oh why didn't I have enough room in the van for this vintage baby buggy?! Vintage Vice- It's funny, I thought Vintage Vice was going to be one of my least-favorite shops but actually, I think it was the best vintage clothing store in town. The selection isn't very big but they had really good prices and what they did have was super cute! I found this sweet little blue button up top- very versatile and Amanda found two really unique, gorgeous dresses. Bass Pro Shop- The biggest in the country! It was so cool to see. Lots of taxidermy, live fish and turtles. Olivia had the best time dragging me all over the store to see the animals. D.A.V. Thrift Store- We happened to drive past this thrift store on our way to the Bass Pro shop. The first dress I touched was this super cute black and white dress. I also found this puff sleeve blouse. For a thrift store, the prices were higher than what I'm used to in St Louis but still much much cheaper than the vintage shops. Well worth stopping for, I think! All in all, Springfield is a cool city to visit. There's lots to see and do. However, I don't ever plan on returning for vintage shopping. If you find yourself in Springfield and looking for some vintage, my best advice is to stick to the flea markets, thrift stores and antique malls. One thing that I really loved about Springfield is all of the cheap antique clothes. 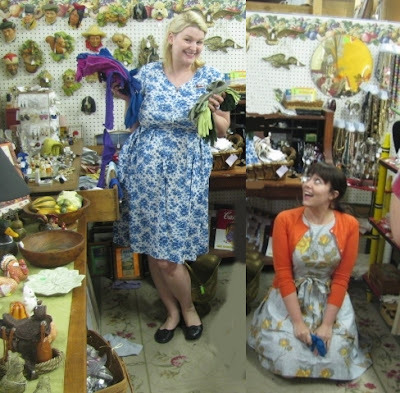 Those antique malls seemed to be full of Victorian and Edwardian dresses and accessories. If I were much smaller, I would have bought every piece! It was a fun trip but I'm happy to be back in St Louis where the vintage is cheap, extraordinary and plentiful. I'll share pics of my pretties that I found in Springfield tomorrow! Off to clean house and get ready for Olivia's B-day party on Saturday!! I did, actually and I was like "meh..." Like I said, I think I'm spoiled by St Louis!